Uh oh! When I saw that shot of an overweight Aamir Khan riding a rickety two-wheeler through a ramshackle town, I thought it was Salman Khan in Sultan all over again. But wait! 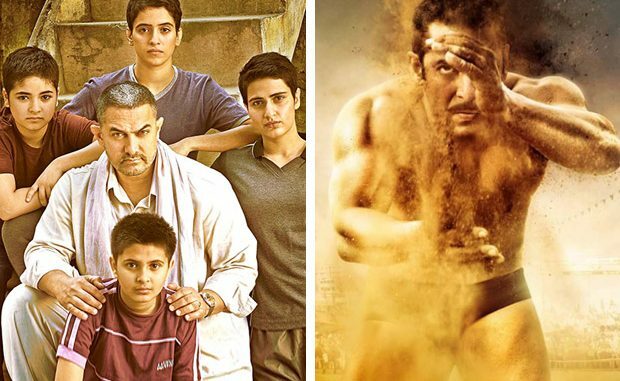 Hang on…Dangal opens up a different realm of wrestling. It is the story of a proud but kind hearted gentle and guardedly liberal patriarch who, when the trailer opens, hopes his fourth-born would be a son whom he can nurture into a gold-medallist wrestler. That’s the crux of this simple heart-warming story. The trailer strings together moments that bead a beautiful bouquet of unfulfilled dreams and fulfilled aspirations. From what I could gather from the trailer director Nitesh Tiwari is not keen on creating complex gender dynamics through the film. Dangal is the story of a retired unsuccessful wrestler with four daughters who decides to make his daughters do what is conventionally the male heir’s domain. Fulfil the father’s unfinished dreams. There is an interesting little scene in the trailer where the mother of two boys beaten black and blue comes to complain .The wrestler patriarch presumes it’s his nephew who thrashed the boys. But no, it’s the wrestler’s two daughters who quietly tell their Dad they beat up the boys for calling the girls unflattering names. This, I reckon, is a turning point in the script and one that we all must stop and gawk at for illustrating the ‘Eureka’ moment when the patriarch realizes that girls can do everything that boys can. Including beat up boys. Dangal is likely to have many such conscience-awakening moments. We need that push in places where our spirit has slipped into slumber. The trailer gives us an array of solid performers. The four girls playing the two wrestler-daughters at two different staged are amazing at their job. Sakshi Tanwar as Aamir’s wife is quietly expressive. But make no mistake this is again an Aamir Khan vehicle. He gets flabby for the first segment (a la Salman in Sultan) and sinewy and muscled for the second segment (again a la Salman). But there is more of everything here than Salman in Sultan. More of the flab, more of the muscles and yes, much more of the Haryanvi accent. All of it, I suspect, will add up to a complete family drama where the girl child will be given the chance to dazzle in the akhaada even if Aamir Khan helms the show. Yes, even Aamir can step back to let the girls have their moment of glory. This is what makes the trailer of Dangal really special. What Did You Really Think Of Katy Perry As Mtv Video Awards Host?